The low interest rate environment has more to do with economic developments, rather than the autonomous actions of central banks, said European Central Bank Governing Council member Ewald Nowotny in a speech Thursday. He added that in this environment it was difficult for a central bank to set interest rates on its own. Speaking at a conference in Alpbach, Austria, Mr. Nowotny said that one of the factors keeping inflation down is globalization. Low prices are “an advantage for consumers, but puts pressure on wages,” he noted. Moreover, growth is also relatively low. “We have a trend of long-term, low growth rates, which is not easy to interpret,” he said. The underlying determinants for these declines are related to the global supply and demand for funds, including shifting demographics, slower trend productivity and economic growth, emerging markets seeking large reserves of safe assets, and a more general global savings glut. Although the main reason was starring him in the face, it is never acknowledged. And that reason is the simultaneous crash in NGDP, resulting from sweeping the monetary policy framework pursued during the great moderation under the rug, first by the Fed, immediately followed by the other nincompoops. We were rightly excited by John Williams letter from San Francisco on Monday as we had already detected stirrings. We and many others were also equally right to wonder what was going on when JW reverted to type on Thursday. The JW-induced downward move in the USD Index stuck. The move down was against all major currencies but specifically against the JPY where it fell through Y100 to the USD for a while on Tuesday and more persistently on Thursday. The Japanese were repeatedly browbeaten by the US Treasury when their currency versus the USD had traded up to Y120. They did what they were told, pulling back from more QE. However, the US Treasury campaign still culminated in the creation of the ignominious “monitoring list” in April this year. 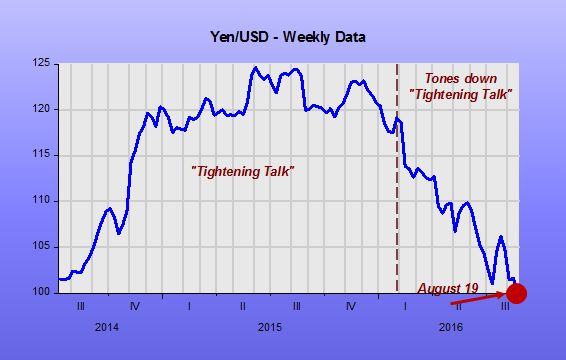 Now the Japanese find themselves with an even stronger currency than in April and overnight we see reported “plunging foreign trade“. In July export volumes were down 2.5% and imports down 4% – despite the new buying power. Exports by value were down 14% and imports by value were down 25%. AD is suffering. Even more USD weakness to come? The reaction to the idea of further reform of US monetary policy by John Williams ahead of the “Designing … Frameworks For The Future” brainstorming at Jackson Hole was pretty swift. Japanese currency chief called journalists into his office in Tokyo and issued a public warning. William Dudley and his market-monitoring colleagues on the NY Fed frontline must have either had a call from Tokyo or felt compelled to react first or both. The NY Fed President’s hastily arranged a five minute interview on CNBC attempted to put a floor on this new USD weakness. Very significantly, he failed. Maybe Dudley failed because he looked so ashen-faced. On such things markets move, or rather refuse to move. John Williams’ latest public speech was very much back-to-business as usual for him, but also failed to raise the USD. However, the NGDP Level Targeting bandwagon may be hard to stop as widely-read commentators as diverse as Larry Summers and Stephen King both weighed into the debate in favour. Ironically, if the US were to adopt NGDP Level Targeting it would lead to a stronger US economy and alleviate the pressure on the currency. The markets do not see it that way at the moment, though. Most of the world’s central banks have had to pull back from their post-2009 tightening, the Federal Reserve probably will be no different. But it will cause a lot of major ripples, no doubt. Things are complicated. The Bank of England appears to have learned nothing at all about the 2008 Great Recession. They are on the verge of making the exact same mistakes as Meryvn King and many other central bank chiefs made in that fateful year. Carney is fretting about headline inflation and other matters while watching NGDP expectations drag down RGDP into a recession. “Rate rise back in the cards as Bank cuts forecasts” warns the headline attached to Philip Aldrick’s lead article in the Business section in The (London) Times today after yesterday’s press conference with Governor Carney at the BoE. We have finally come to this, 2008 redux. The real economy is slowing, perhaps teetering on a recession. Yet a modest uptick in projected inflation two years out leads the Governor of the Bank of England to passively tighten monetary policy with threats to actively tighten. The famous fan charts from the BoE show a tiny shift of the centre point in 2018 above 2%. It leads to a furrowing of Carney’s brows and leads him to give dark warnings about having to raise rates. Sterling even rose at first versus the USD despite all the Brexit fears and recession fears pushing it lower. Yet the same set of data has fan charts for RGDP that show growth dropping below even the poor levels of recent years. Never was there more need of a switch to NGDP targeting that allows flexibility of inflation targeting to be combined with what is going on in the real economy. Sure, the BoE can’t raise RGDP growth in the long run as they can’t directly impact productivity but they can prevent recessions – and thus lost real output and in the long run lead to higher levels of RGDP than if there were recessions. Many of the headlines are about Carney’s views on Brexit, but they hide a more damaging ducking of responsibility to ensure price stability, unless there is a major negative impact on economic growth. Raising rates now, or even threatening to do so, is having a major impact on economic growth. And there certainly will be no price stability if we have a recession. Inflation is bound to slow dramatically. Two wrongs (deflation and recession), no right. I was pleased to report some traction in the Market Monetarist campaign to see inflation targets substituted by, or added to, an NGDP growth target. One common pushback I’ve received recently is if the central bank can’t hit a 2% target how can it hit a tougher target? It’s a reasonable question. First, central banks in the US, UK, Euro Area and Japan, don’t want to hit their 2% targets. An odd claim, I know. But on closer inspection they now actually operate a 2% medium term target, crucially based on their own forecasts of inflation. Any time their medium term forecast approaches 2%, or worse moves above it, the noise level about interest rate paths gets very loud. The Fed even raised rates! This targeting a target has been discussed before here, and is very depressing to economic activity, real and nominal. It ends up with actual inflation consistently below the 2% target. It is rather like most people’s two year out plans, they never seem to quite come off. Second, moving to a 4% inflation target and missing it by 1-2% is far less damaging than missing a 2% target by 1-2%. Modest 2-3% inflation is consistent with 5% nominal growth, i.e. trend nominal growth. Stable nominal growth is the proper target for central banks, agreed by most people, even central banks. Central banks wouldn’t have to hit 4% but turning it into a target would enable the market to believe the central banks were happy with 2-3% inflation now. Even four percent inflation, if achieved, would not be terribly damaging either. Market Monetarists are not crazy inflationists, just dull-sounding moderate inflationists, and very hostile to missing lowflation targets. The truth of the matter is that they don´t like the word “inflation”. Third, simply moving the target obviates the need for the sort of oxymoronic “responsibly promise to do something irresponsible” thing Paul Krugman again suggests in a response to a Tony Yates blog post. No one in markets takes such nonsense seriously. Central banks do not operate like that, and if they did markets would be worried about other stuff pretty quickly. Just change the target to something more ambitious, but still credible and responsible. It would also end the ridiculously unnecessary, frankly idle, chatter about helicopter drops. Last an NGDP growth target is a different animal to an inflation target. NGDP is simply aggregate demand or aggregate income. It is what the central banks have almost exact control over. Inflation is a terrifically hard to calculate residual of the difference between easy to calculate nominal demand and terrifically hard to calculate real demand. The exact balance of any nominal growth between real and inflationary growth is very difficult to divine in real time. It is, nevertheless, very important to understand and to fix if the balance is too much inflation and not enough real. That debate is no concern of the central bank. Inflation is simply the wrong target for them. They control money and therefore the other half of all economic transactions, not output. It’s a powerful tool, use it! 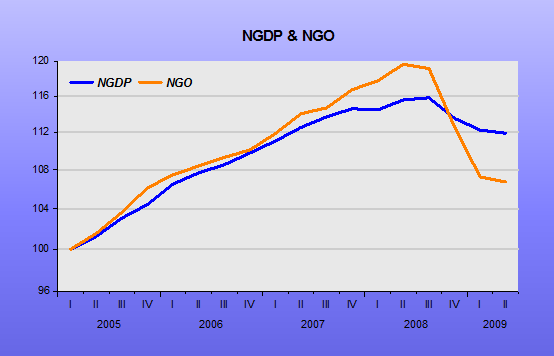 If monetary policy should shift to targeting nominal spending, NGDP is not the best indicator – NGO is. Nick Rowe did a post (which includes a pertinent comment by Matt Rognlie). When there is a shift of the demand for money, this will affect all transactions, not only those on final goods. Thus, my first point: gross domestic product is not necessarily the best for monetary transaction. However, Market Monetarists are not on the lookout for the best indicator of monetary transactions, but are focused on Nominal Stability, and that is attained when NGDP follows a stable level growth path. 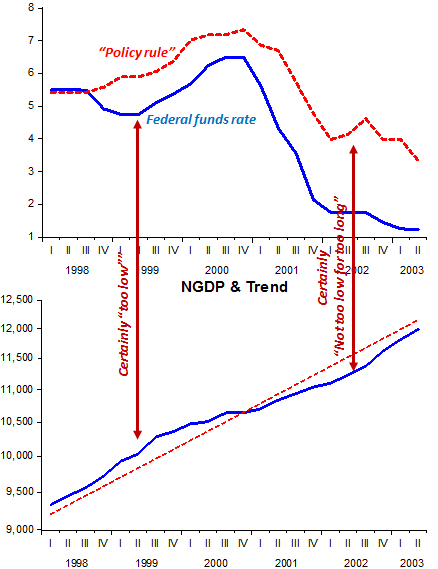 …total nominal spending did drop massively during the recession (see the fall of wholesale, gross output and retail) while NGDP barely moved while, before the recession, total nominal spending did increase much faster than NGDP. I almost chocked when Vincent says “NGDP barely moved”. In fact, the drop in NGDP was the biggest since the 1930s! …This confirms the hypothesis that commodity prices played a big role: you’d expect them to push up nominal GO/VA in 2007 and early 2008, then push it down in late 2008, which is exactly the effect that disappears once you control for prices. And therein lies the problem in trying to target NGO. It is much like trying to target headline inflation (or the headline price level). Those targets are often “polluted” by relative price changes arising from, for example, oil price shocks. 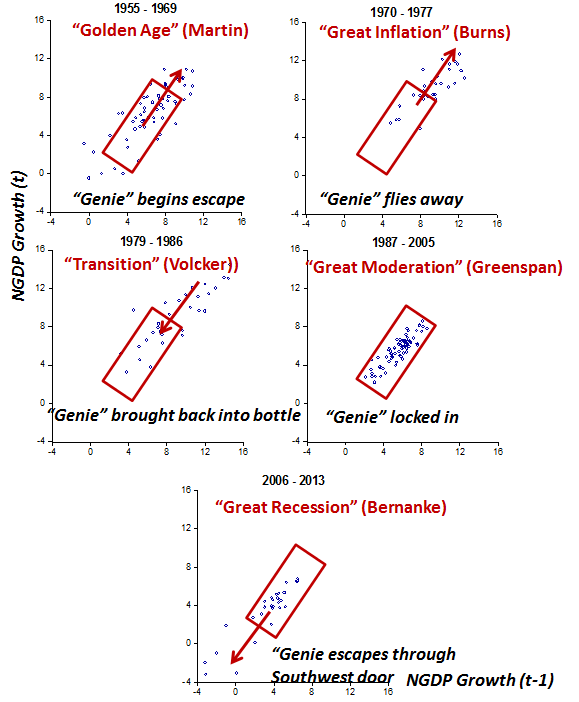 These old charts illustrate the Nominal Stability generating power of having NGDP growing close to a target trend path. Although there´s no equivalent NGO data to compare, I doubt the structure of NGO would give rise to an equivalent outcome. In a few decades, if the European monetary union experiment has failed, the gravestone will be marked with the utterly depressing and anti-stimulative inflation objective of “Below, but close to, two percent”. You just knew the press conference after the ECB meeting this week was going to go badly when Draghi intoned the dreaded six words in the second paragraph of his opening statement. This was a record for the year in fact. My analysis shows that normally it is in the third paragraph, and at the last two press conferences it was rather excitingly relegated to the sixth and seventh paragraphs. There can be no convincing recovery in the Euro Area while there is an inflation ceiling like this. Scott Sumner has already opined on the undoubted tightening of monetary policy today as markets reacted negatively: the Euro currency strengthened and stocks fell. He also correctly points out that expectations were running high. However, the data from the rear view mirror isn’t too bad if you look at base money or NGDP growth. Draghi pointed out the strong growth of M1 at 11% before launching into the newer central bank creed of creditism. Loans were much cheaper, following bond yields down. Of course, true success for his monetary easing would be bond yields rising. Ironically, on the day yields did rise. But this was more due to the disappointment of no additional QE bond buying rather than any additional hopes for a recovery. A sort of reverse liquidity effect (ie bonds had been overbought and fell back in price) rather than any Fisher effect (where higher nominal growth expectations cut the real return on bonds and their prices fall). I am still looking for silver linings and was very interested to see this policy report from a pro-European think tank, the Centre for European Reform, with a very heavyweight Advisory Board of VSPs. The author, Christian Odendahl, recommends ending national monetary influences in the ECB Board – a great idea and one we alluded to recently. 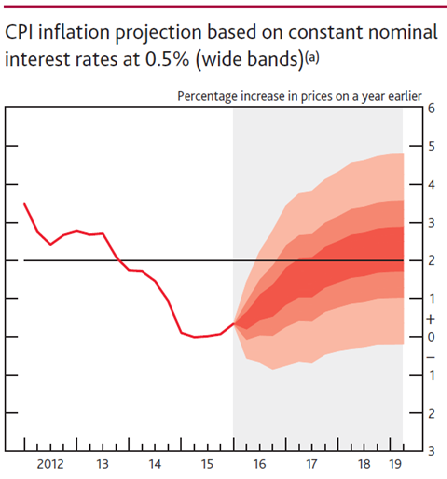 But even more he recommends investigating targeting a higher inflation rate, a level target and even Aggregate Demand. A stable level of demand is crucially important in a monetary union, as excessively low demand can lead to regional depressions and soaring debt, destabilising the whole union in the process. The European Central Bank (ECB) has failed to maintain the necessary level of demand and inflation during the course of the eurozone crisis, and needs a stronger mandate to prevent this from happening in the future. Such a mandate should include a higher and symmetrical inflation target, as well as the explicit responsibility for maintaining an adequate level of demand. National central banks should no longer be involved in eurozone monetary policy, since they tend to politicise decisions along national lines. Ideally, therefore, the ECB should be given a more robust and activist mandate to manage demand. « An explicit commitment that this target be symmetrical, so that undershooting and overshooting the target are of equal concern. « A provision to take overall demand into account, rather than just inflation. In 2011, for example, inflation rose but demand was weak – and the ECB made the wrong decision to raise interest rates, which weakened demand further. In such a situation, preference should not be given to inflation. Odendahl also included a great, Marcus Nunes-style chart showing the colossal failure of the ECB to properly manage Aggregate Demand, aka Nominal GDP. Odendahl referred readers to the recent European Parliament hearing on NGDP Targeting. A draft of just one of the papers had found its way onto various blog sites but the link shows there were in fact three papers presented. I have reproduced all three abstracts of the final papers. It is both fascinating and hopeful that academics from leading German, French and British economics departments were represented even if only one (can you guess which?) was clearly in favour. The two others were sympathetic but did go off on some strange tangents. One favoured flexible inflation targeting and thought NGDP targeting wouldn’t help central banks with their central problem of “financial stability”. The third favoured a complex amendment to the Taylor Rule. Is nominal GDP targeting a suitable tool for the ECB’s monetary policy? We seek to clarify whether or not nominal GDP targeting (NGDP) may be a suitable tool for the ECB’s monetary policy. We argue that this question really consists of three distinct but related questions: (1) Is it better for the ECB to put more weight on output than it does currently, by switching to a NGDP target? (The theoretical evidence suggests, maybe, but this depends on the distortions faced by the economy.) 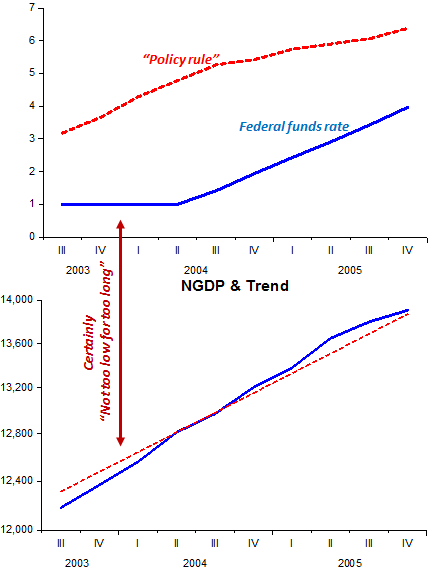 (2) Should a NGDP (or inflation) target be formulated in rates of growth, or in levels? (The theoretical evidence suggests that a levels target may have some appealing properties, by stabilizing expectations.) (3) What technical issues remain to be addressed? (Issues include the selection of an operating instrument, difficulties in estimating trends, data revisions, and communication.) Altogether, we argue that thinking about nominal GDP targeting in this way might help to clarify what is otherwise a confusing debate. 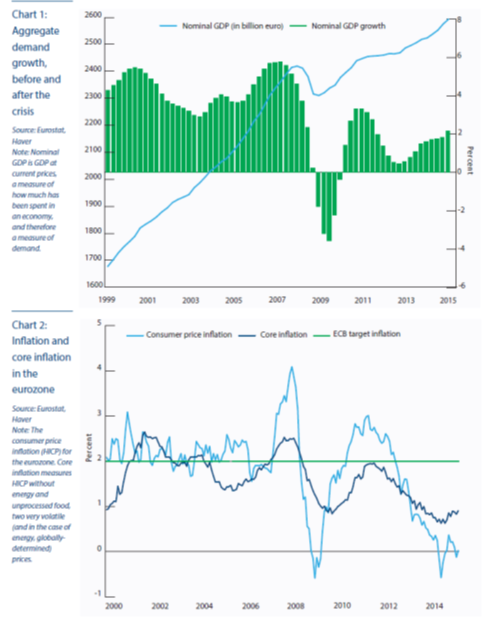 We assess the pros and cons of nominal GDP targeting vis-à-vis flexible inflation targeting regime. We show that the benefit of a regime shift towards nominal GDP targeting in the euro area might be small. Moreover, nominal GDP targeting is not concerned with financial stability. Finally, targeting nominal GDP would make ECB communication very difficult. If the aim of a regime shift were to bring the ECB to pay more attention to growth, it would be more straightforward to fix a dual mandate and to set an explicit target for real output growth or the unemployment rate. Is Nominal GDP targeting a suitable tool for ECB monetary policy? The idea of targeting smooth growth for nominal income (GDP), as an alternative to the conventional Taylor or inflation targeting rules for setting monetary policy, has been in discussion for many years. But they have never been used in practice. In this paper we review the pros and cons of adopting such an approach, and find them to be rather finely balanced. To dig deeper, we consider certain particular features of nominal income targeting: the crucial role of supply side responsive- ness (nominal income targeting substitutes for poor responses or a lack of market or structural reform); the need to bring market forces into play; the question of whether income targeting increases discipline; and the extra constraints imposed by having a dual mandate. 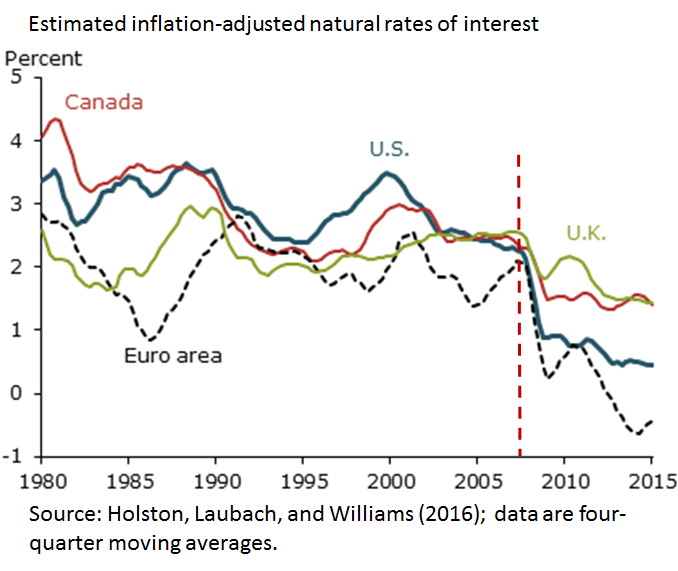 The upshot is that nominal income targeting emerges as a special case of the more flexible Taylor rule formulation, although it does generalise on pure inflation targeting. In practice the Taylor rule form may be improved by using time varying, state contingent coefficients. De facto, this is what the ECB has done in recent years. The simulation studies available suggest that the more flexible rules of this kind perform better in reducing the fluctuations of output and inflation away from target; and are, crucially, more robust to model uncertainty (important for design) and real-time data/information errors (important in implementation). MORRIS. I think we need a proxy–an independent intermediate target– for nominal GNP, or the closest thing we can come to as a proxy for nominal GNP, because that’s what the name of the game is supposed to be. JORDAN. This question of when the time is going to come to change the [funds] rate–especially in an upward direction–and the criteria for doing so has been on my mind a lot, and I’m sure it has been in everybody’s thinking. This is my seventh meeting, and I thought it was time to go back and review the last year and to look at what actually has happened in terms of all kinds of economic indicators–monetary as well as economic indicators, nominal and real indicators–and Committee actions to see if I could deduce an implicit model. I read the newsletters, as I’m sure everybody does; and [unintelligible] and I don’t see it in the numbers, it’s certainly not inflation. It’s not the various money measures: Ml, M2, the base, or bank reserves. I don’t even think its real GDP. I put together a table–a big matrix of every forecast for as many quarters out as the Greenbook does it–for every meeting for the last year. What struck me was that it looked as if we were on a de facto nominal GNP target. When nominal GNP is at or above expectations, the funds rate is held stable; but when nominal GNP comes in below what has been expected, we cut the funds rate. As I read it, there is no debate within this Committee to abandon our view that a non-inflationary environment is best for this country over the longer term. Everything else, once we’ve said that, becomes technical questions. I would say in that context that on the basis of the studies, we have seen that to drive nominal GDP, let’s assume at 4-1/2 percent, in our old philosophy we would have said that [requires] a 4-1/2 percent growth in M2. In today’s analysis, we would say it’s significantly less than that. I’m basically arguing that we are really in a sense using [unintelligible] a nominal GDP goal of which the money supply relationships are technical mechanisms to achieve that. The FOMC had a long, serious discussion of NGDP targeting in 2011. And soundly rejected it. Bernanke is really an inflation targeting freak! Note than in 1982 or 1992, no one said that by targeting NGDP the Fed “had suddenly decided it was willing to tolerate higher inflation, possibly for many years”. 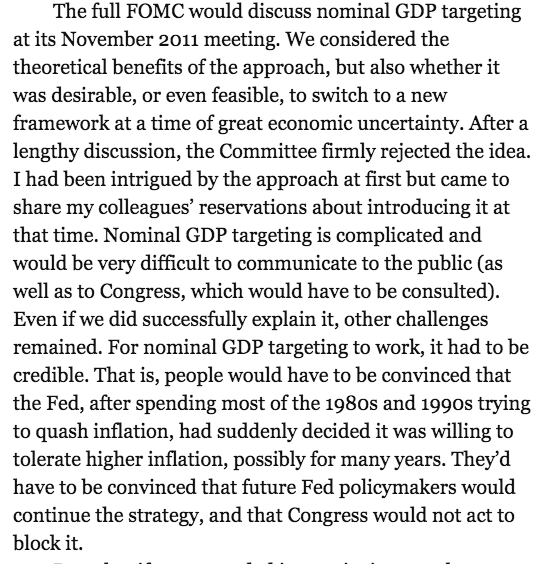 And just two months after this discussion, in January 2012, the Fed made the 2% target official policy! 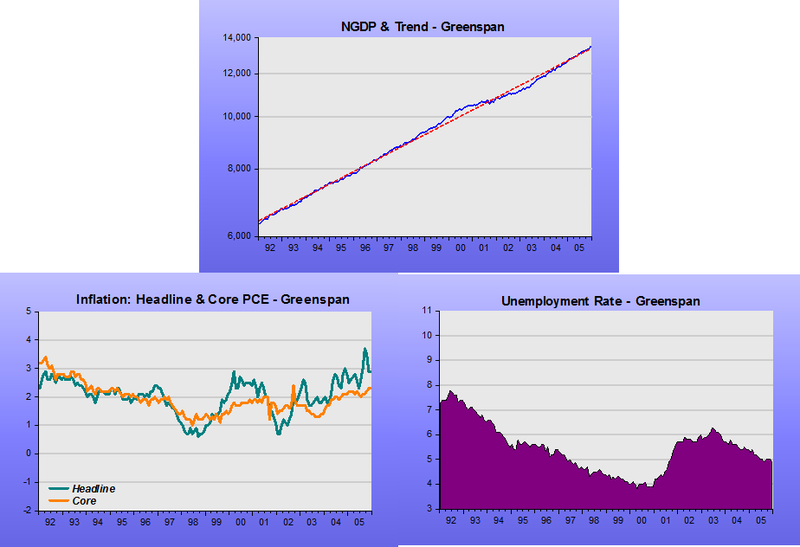 That said, I think it is worthwhile to check if Greenspan´s words were meaningful. The panel below pictures what went on in the NGDP, inflation and unemployment fronts from then to the end of his tenure. The next panel shows how those things continued into the Bernanke/Yellen era. One could say: “so what”? Inflation has remained low, even below the now official target, and unemployment has come down to a “comfortable” level. 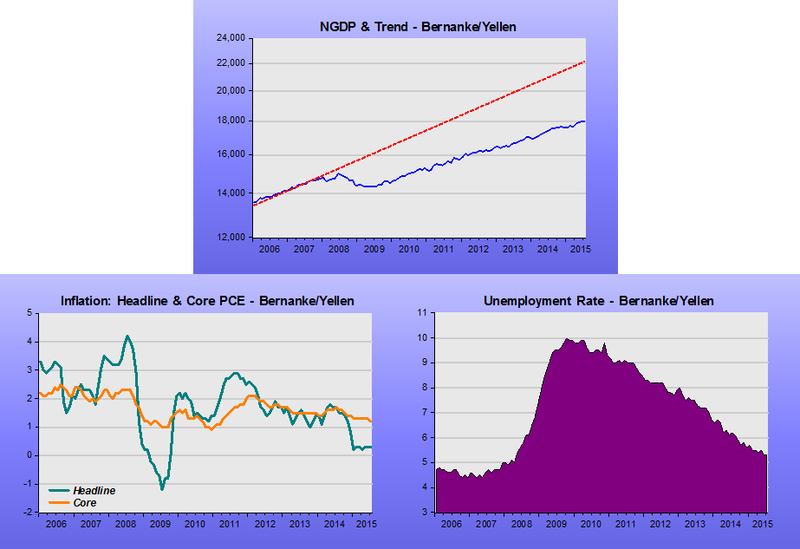 Bernanke has said the “Fed saved the economy – full employment without inflation is in sight”! Congress is largely responsible for the incomplete recovery from the 2008 financial crisis, Ben S. Bernanke, the former Federal Reserve chairman, writes in a memoir published on Monday. Mr. Bernanke, who left the Fed in January 2014 after eight years as chairman, says the Fed’s response to the crisis was bold and effective but insufficient. In a few instances, Mr. Bernanke also acknowledges, the Fed could have done more. He writes that the decision not to lower rates in September 2008, immediately after the collapse of Lehman Brothers, “was certainly a mistake.” The Fed’s benchmark rate then stood at 2 percent; by the end of the year, it had been cut nearly to zero. Bernanke gave a narrow interpretation to “stable background”, defining it in terms of “low and stable inflation”. If instead of low and stable inflation he had pursued a stable growth path for nominal spending (NGDP) he would have avoided the crash. Inflation is low, unemployment is back (almost) at “full employment”. So what´s missing, allowing the gap to remain wide open? As the charts show, the unemployment rate has a different “meaning” in the two periods! And the last chart provides a “summary statistic”. In the 2001 recession, NGDP growth slumped, but was brought back up so that the trend level of NGDP was regained. 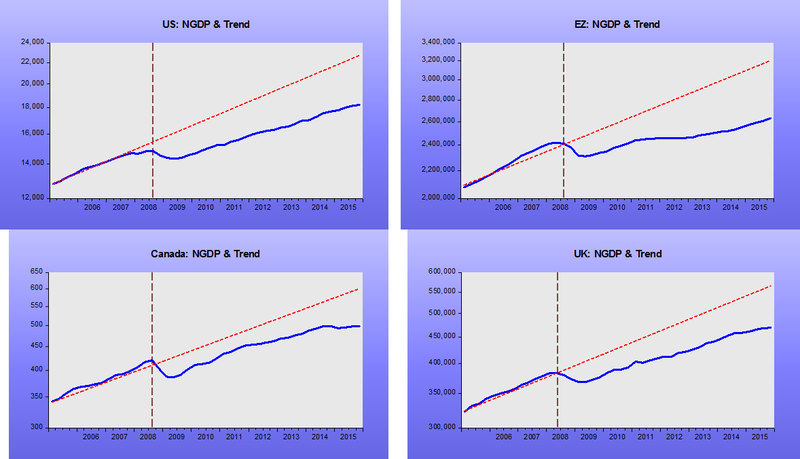 In the 2007-09 recession, NGDP growth “caved” and has remained far below the trend growth, implying that there has been no “recovery”, with the economy remaining “depressed”! And that´s no fault of Congress, but the result of Bernanke´s (and the Fed´s) obsession with inflation! Advocates of purely discretionary monetary policy frequently list Kydland and Prescott’s time inconsistency argument as the only reason for policy rules, and then they try to shoot that down or say it is outweighed by arguments in favor of discretion. This is the gist of Narayana Kocherlakota’s recent argument for pure discretion. Understandably, John Taylor is an unconditional fan of his namesake rule. Interestingly Yellen says that the Fed shouldn´t “be chained to any rule whatsoever”. Why? Because monetary policy requires “sound judgment”? And rules won´t provide that? Maybe that´s a problem associated with “instrument rules” like Taylor-type rules, which give out the “desired” setting for the interest rate instrument (the FF target rate in the case of the US). What if the central bank, instead of an “instrument rule” adopted a “target rule”? For concreteness, let´s assume the Fed had adopted (maybe implicitly) a NGDP level target as it´s rule for monetary policy. 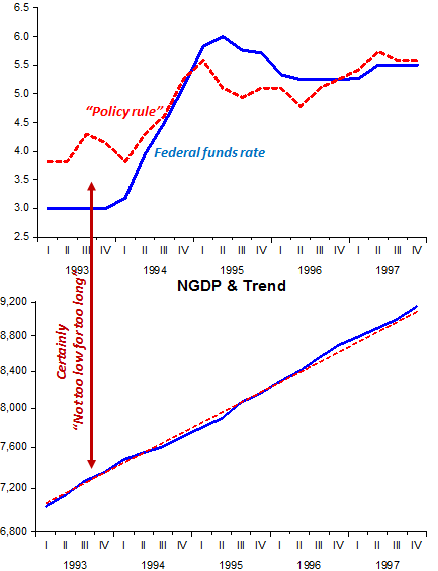 The charts compare and contrast the interest rate “policy rule” and the NGDP level target rule (where the “target (trend) level” is the “Great Moderation” (1987-05) trend). 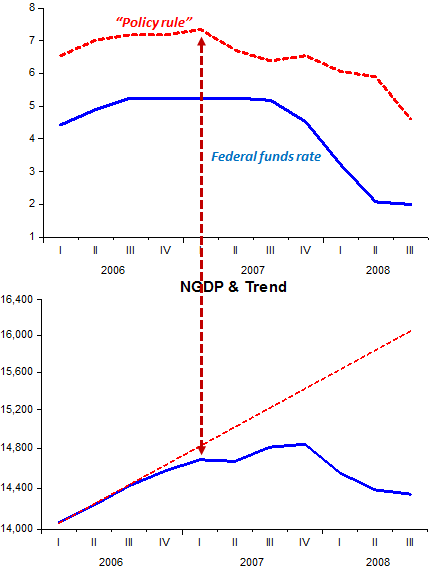 In this comparison, the actual setting of the Federal Funds (FF) rate is “right or wrong” depending on, not if it agrees with the setting “suggested” by the instrument rule, but if it is the rate that keeps NGDP close to the target path; and in case there is a deviation from the path, if the (re)setting drives NGDP back to the target. For the “instrument rule”, I use the Mankiw version of the Taylor rule. The Mankiw version is simpler because it doesn´t require the estimation of an output gap and doesn´t state an inflation target rate (which the Fed didn´t have any way until January 2012). The first chart shows John Taylor´s chart from his original 1993 paper. Note that it is qualitative (even if not exactly quantitative) similar to the “policy rule” obtained with the Mankiw rule. During this period (1987 – 1992) monetary policy was “quite good”, in the sense of keeping NGDP close to the “target path”. 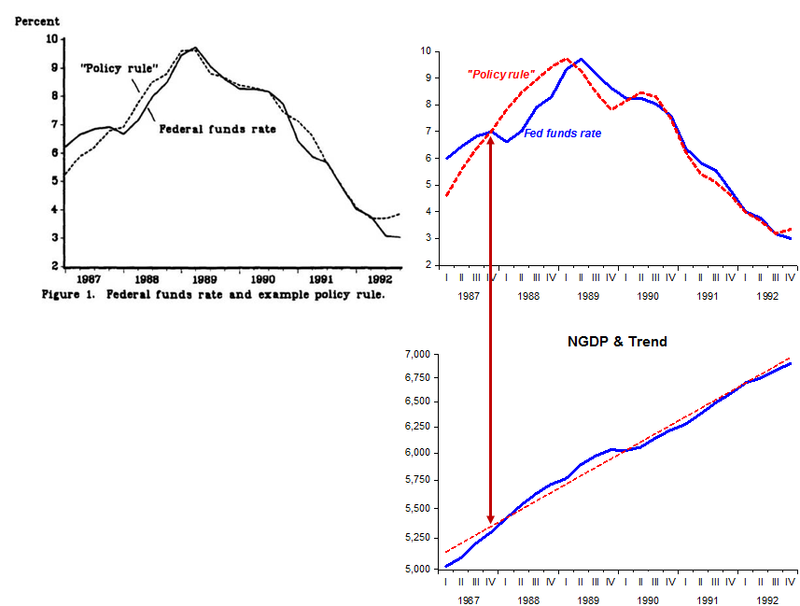 Actually, when the Fed reduced the FF rate at the time of the stock market crash, it turned monetary policy a bit too expansionary, given NGDP went a bit above trend. The next period covers 1993 – 1997. This is the core period of the “Great Moderation”. At the end of 1992, the FF rate had been reduced to 3%, a level which was maintained throughout 1993. According to the “policy rule” this was “too low”. With respect to the “target rule”, the FF rate was “just right”. All through those years, NGDP remained very close to the “target path”, although the FF rate at times differed significantly from the “policy rule”. The next period, 1998 – 2003.II is pretty damaging to the “policy rule” advocates. Taylor likes to say that the 2002 – 2005 period was one of “rates too low for too long” (having responsibility for the crash that came later). What the chart tells us, however, is very different. The FF rate was too low in 1998 – 99. At this time, the Fed reacted to the Russia crisis (and the LTCM affair). Monetary policy loosened up at the same time that the economy was being buffeted by a positive productivity shock. The monetary tightening that followed was a bit too strong because NGDP dropped below trend. The downward adjustment of the FF rate was correct in the sense that it stopped NGDP from falling lower, and by mid-2002 it began to recover. I wonder how much more grief the economy would have been subjected to if the “policy rule” had been followed. The 2003.III – 2005 period is the second half of Taylor´s “too low for too long”. In the FOMC meeting of August 2003, the Fed adopted “forward guidance” (FG) (first it was “rates will remain low for a considerable period” followed by “will be patient to reduce accommodation, and finally “rates will rise at a measured pace”). The fact is that FG helped push NGDP back to trend. Maybe the “pace was too measured”, but the fact is that by the time he handed the Fed to Bernanke, NGDP was square back on trend. If the “policy rule” had been closely adhered to, the “Great Recession” would likely have happened sooner! And now (“the end is near…”) we come to see how the Fed botched monetary policy (likely due to Bernanke´s preferred inflation targeting monetary policy regime). The FF rate remained at the high level it had reached at the end of the “measured pace story”. 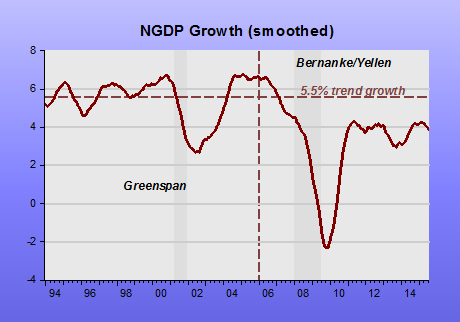 At the end of 2006, aggregate demand (NGDP) began to deviate, at first slowly, below the trend level. The FF rate remained put (notice that although too high, the “rule rate” changed direction). The FOMC was not comfortable with the “elevated” price of oil and kept hammering on the risks of inflation expectations becoming un-anchored (see the late 2007-08 FOMC transcripts). Despite the reduction in the FF rate, monetary policy was being tightened! And the “Great Recession” was invited in! Maybe there would have been a “Second Great Depression” if the “policy rate” had been followed closely. Moral of the story. Yellen and the Fed do not have “infinite degrees of freedom”, hidden under the umbrella of “sound judgment”. They would do well to set a “target rule”. Japanese Prime Minister Shinzo Abe will announce a plan on Thursday to raise gross domestic product by around 22 percent to 600 trillion Japanese yen ($5 trillion) as he refocuses on the economy after the passage of controversial security bills that eroded his popularity. NGDP data revisions means targeting it is “totally impractical”, really? 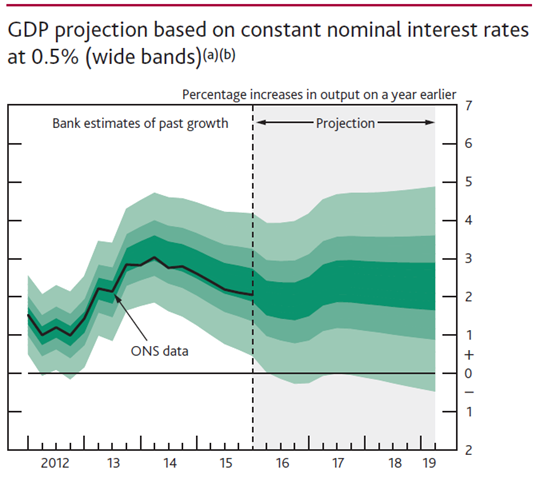 Danny Blanchflower, the enfant terrible of the Bank of England when he was for a time on its rate-setting Monetary Policy Committee, tweeted here that NGDP Targeting was “totally impractical” because it was a figure that was so subject to data revisions. Well, first off, revisions don’t matter to Market Monetarist advocates as the “Market” bit of MM refers to the theory that you should target expectations for NGDP Growth. Scott Sumner has argued for a market in NGDP Futures so accurate market forecasts of NGDP growth could be used. This proposal is not much of a leap for standard macro theory that argues you control inflation by targeting inflation expectations. So it’s no big deal to target forecasts, every macro-economist should get that bit. Market Monetarists are highly sceptical of inflation expectations as measured purely in surveys. The public has little understanding of the term inflation. Although the public sees their shopping basket go up and down in cost it has only modest relevance to the central banks that like to target core inflation, i.e. excluding volatile food and energy. On saner days central banks actually target the measure of inflation that gets them from NGDP to RGDP, known as the GDP Deflator. This figure often runs well below measures of consumer inflation. A good discussion on the good reasons why this happens is here. Consumers would also have little view on NGDP, of course, if that were targeted. They would roughly see one large element though, in aggregate wage or income growth. This is because NGDP (and therefore RGDP) can be measured by adding up all the income in the economy, via the “income method”. The two other ways to measure NGDP are the self-explanatory “expenditure method” and the very tricky “output method”. Of course, I don’t have to explain this to expert economists like Danny Blanchflower. Second, NGDP should, in theory be more reliable to measure since RGDP is based upon NGDP. Any errors in NGDP will, de facto, be in NGDP. However, RGDP errors are then compounded by errors in the deflator. It is therefore impossible for RGDP to be more reliable than NGDP. 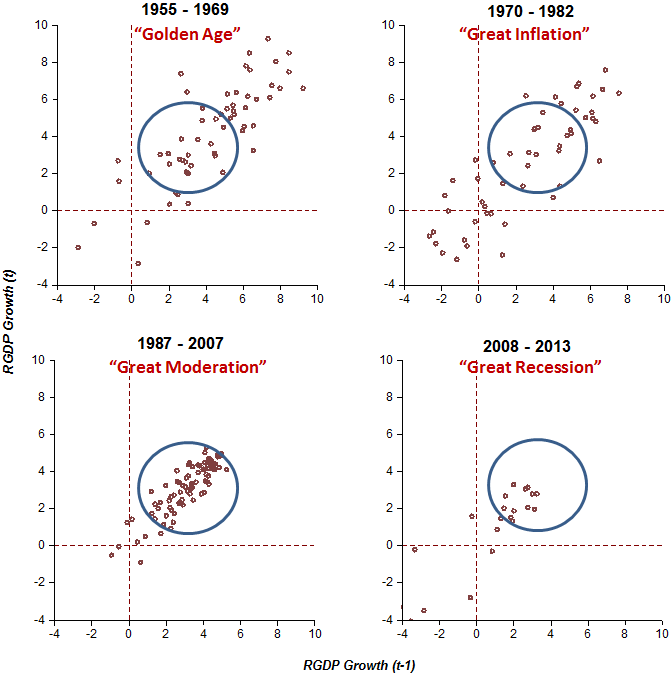 The question is then whether NGDP is more or less prone to error than “inflation” measures. Well, NGDP only has one definition, so that certainly helps, inflation many. The infamous switch in the UK from RPI to CPI as the main method was certainly a major revision to method and certainly sowed huge confusion. It still does cause problems as index-linked bonds are still based on RPI, as are most inflation-protected pensions and other forms of financial income. Lastly, Blanchflower demanded that I provide some empirical research that NGDP is less prone to error than RGDP or “inflation”. 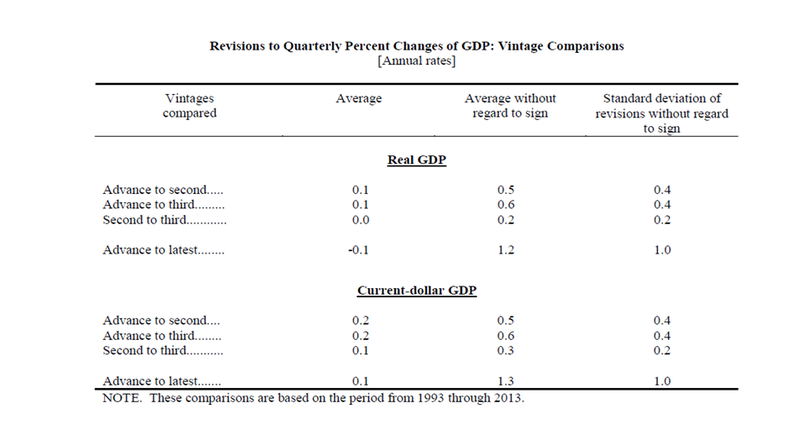 Well, here is a study by the US statistical office, the Bureau for Economic Analysis that demonstrates that NGDP (“Current-dollar GDP” in the table) is at least as reliable as RGDP looking at the period 1993-2013. This can’t actually be true given RGDP’s two sources of error. The resources spent on RGDP are much larger than those spent on NGDP so that may account for the BEA’s result. Whatever, it at least shows Blanchflower’s “totally impractical” is just wrong in fact as well as theory. He should stop talking nonsense. The great benefit of NGDP Targeting is that it means the central bank concerns itself only with nominal stability and doesn’t have to get concerned with the balance between inflation and real growth, or the hard to measure productivity growth that drives the difference. Those issues can be left to real economy experts to sort out. In this way of thinking neither inflation nor Real GDP growth should be of any concern to a Nominal GDP Targeting central bank. The “Blade Runner” comes from his talk in the IMF´s “Monetary Policy in the Future” panel. Some of these approaches have the advantage of helping deal with the zero-lower-bound problem, at least in principle. My colleagues at the Fed and I spent a good deal of time during the period after the financial crisis considering these and other alternatives, and I think I am familiar with the relevant theoretical arguments. Although we did not adopt one of these alternatives, I will say that I don’t see anything magical about targeting two percent inflation. As our research on the use of this approach around the world documents, successful inflation targeting requires that the central bank and elected officials make a public commitment to an explicit numerical target level for inflation (usually around 2%), to be achieved over a specified horizon (usually two years). Equally important, the central bank must agree to provide the markets and the public with enough information to evaluate its performance, and to understand its reasoning when policy and inflation deviate from the long-run goal–as they inevitably will at times. What I really want is for him to explain the reasoning behind, not the deviation of policy and inflation from the long-run goal, but the complete failure of policy in keeping inflation anywhere near close to the long-run goal, and the utter loss of the nominal stability that had characterized the previous 20 years! Former Federal Reserve Chairman Ben Bernanke, a key architect of the federal government’s rescue of the financial system, is joining Chicago hedge fund Citadel LLC as a senior adviser. Mr. Bernanke will consult on developments in monetary policy, financial markets and the global economy, Citadel said in a release. “His insights on monetary policy and the capital markets will be extremely valuable to our team and to our investors,” said Citadel founder and chief executive Ken Griffin in the statement.